New Sitemeter launches and rolls back to Classic Sitemeter inside 24 hours - example of a bad launch or good crisis management? Sitemeter made massive changes to their offering this weekend, but just 24 hours after doing so have rolled back to the previous 'Sitemeter Classic' version. 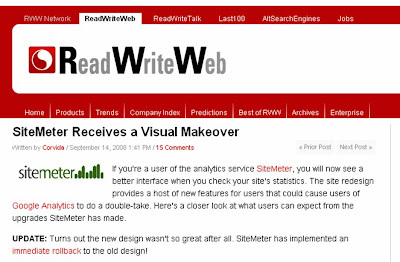 Sitemeter's move back to the original Sitemeter interface is a humiliating backtrack, however Sitemeter should be applauded for the speed with which they have recognised and responded to the negative feedback over new Sitemeter. So why did it go so badly wrong? 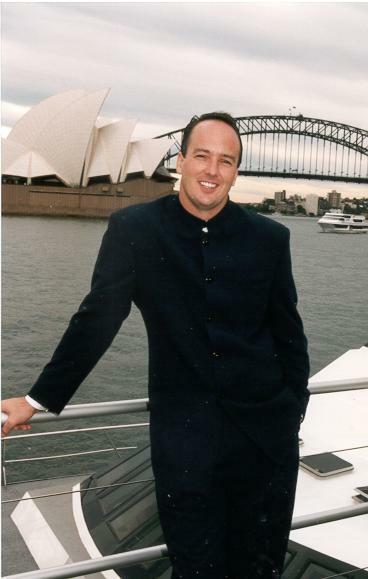 However, I use Sitemeter because it's not Google Analytics. Sitemeter gives quick and easy access to basic stats about this site - how many people have visited and what pages have they looked at. These statistics can be accessed with one click and can be accessed from both mobile internet and desktop. Google Analytics can give more insight but it requires login, setting up reports, can't be easily accessed from mobile and just takes more time to use. Therefore I have free Google Analytics as a backup in the background, but use Sitemeter regularly because it's quick and simple. The pre-change PR makes it look like Sitemeter want to challenge Google Analytics. At the moment I use both as they complement each others offerings, however if Sitemeter changes to become a Google Analytics clone then I will turn it off because why do you need 2 versions of the same thing? 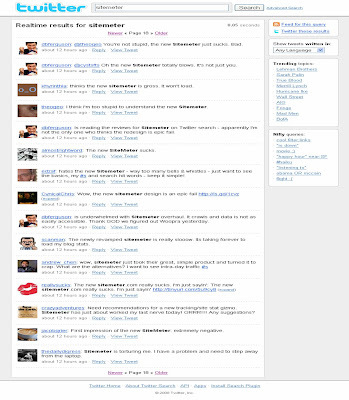 This barrage of criticism was also evident on blogs and forums. Sitemeter were clearly tuned into this and have responded quickly. 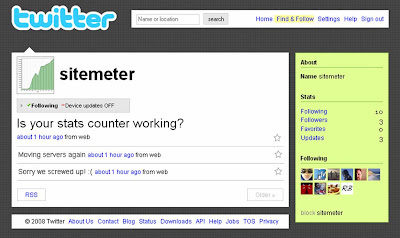 Firstly, by establishing a Twitter presence and using it to respond - Sitemeter may not have many followers, but the Sitemeter comments show up in Twitter Search results. It really feels that the changes were implemented, because there seems to be a disconnect between what Sitemeter think their users want and what Sitemeter users actually want. 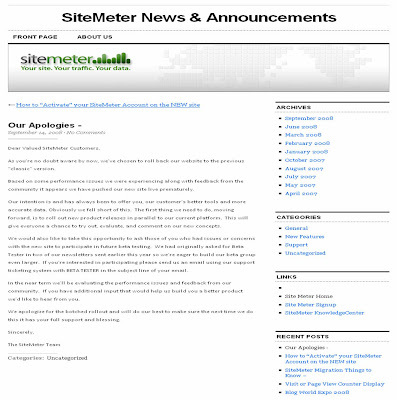 Sitemeter have done well to respond so quickly to the negativity around the Sitemeter changes (and Twitter has clearly been valuable in helping Sitemeter gain quick user feedback), but I can't help thinking that better user insight before relaunch could have prevented the problems seen this weekend? yep I noticed sitemeter was back to normal for my www.Collins.net.pr/blog site this morning - i thought it crashed and that why they rolled back so thanks for your article. I totally agree with you about the reasons to use sitemeter over google analytics - i would have swappen to google if they didn't fix it in a week or so. maybe they should give people the choice of viewing it both ways - sitemeter classic or sitemetr new (lol pun on coke new for those who can remember). Either way great job guys.